However, very few are getting engagement right, leaving them with small audiences and less than impressive results. Fortunately though, social media is one of our specialities and we’re going to share with you the 5 most important things you can do to grow your audience. The vast majority of us use social media now, so it’s likely that your employees do as well. The image they portray online should be an extension of what your brand stands for. Try to leverage this by encouraging them to promote your brand values in a positive light. Also, encourage them to share your most recent ad or your latest piece of content (especially if they played a part in creating it) and you will effectively be getting free marketing. It’s important that you start from the ground up by ensuring your employees have the correct training and feel valued and part of the team, as failure to do this correctly may result in a negative brand perception. Today, marketing is all about integration so make sure that your social accounts are in tune with your other marketing activities, both online and offline. It’s a good idea to make sure your social channels are prominent on your website; this may seem like an obvious statement but by not doing so you could be missing out on numerous impressions, interactions and even sales. Hashtags are all over the internet at the moment so why not have one associated with your traditional marketing campaign, such as a television advert, and encourage customers to engage with your brand online? One study found that a TV ad including a hashtag received 42% more tweets than one without these ubiquitous characters. Car manufacturer Audi was the first to run a Super Bowl advert that featured a hashtag in 2011. The company’s new tagline ‘Luxury has progressed’ was shortened to #Progressls, which flashed up at the end of the ad, along with the Audi name and logo. A competition ran alongside this, whereby anybody who tweeted the hashtag & related URL were automatically entered into a prize draw to win a trip to California to test drive an Audi car. Although the ad was designed for the Super Bowl, the company used the hashtag throughout its promotions for most of the year and an interview with Audi’s social media manager revealed that Twitter “served as the best tool for outreach and response in real time”. Furthermore, the hashtag produced a huge volume of customer responses and, even though it had no specific mention of the company name or any of its products, it still generated a lot of brand exposure for Audi purely due to its association with the brand via the TV ad. Nobody wants to share news about your company restructure because, unless they work for you, it’s probably of little interest to them. Share content that people will want to read/download with and share with their friends and colleagues; that’s relevant but different enough to make you stand out from your competitors. Remember to ensure all content is consistent with your brand image, otherwise your social presence may seem discordant with your other marketing messages and channels. Although creating engaging content can be more difficult for brands in industries that may be perceived as dry by the mainstream, such the financial services sector, a community will still exist that’s interested in the latest news on topics like share prices and interest rates. Therefore, it’s important to manage stakeholder expectations and understand that you’re probably not going to attract large numbers of followers. Instead, you might want to go after a smaller subsection of highly engaged users who are more likely to convert. In 2012, Metro Trains fashioned a strategy to change an uninteresting public service message into an engaging piece of content, with the aim of reducing train related injuries in Melbourne. To do this, they created 21 cartoon characters and incorporated them into a three-minute video with a song that was both shocking and morbidly funny. This campaign became a huge global hit and is now one of the most successful public service campaigns in Australia. If you don’t engage with your audience, why would they want to engage with you? Be the one to make the first move. Contribute to hashtags that are associated with your industry and piggyback on any trending topics as this will allow you to become part of the community in which you operate, making your brand more visible to others. 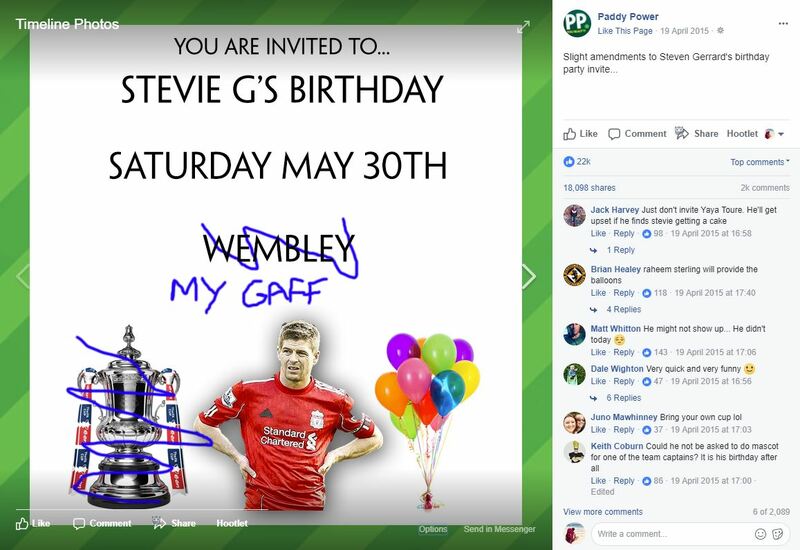 Bookmaker Paddy Power has a great track record with this kind of marketing. Quick to jump on sports news, they use comical and controversial memes, pictures and comments to start conversations with their audience and get people talking about their brand. However, also try to learn a lesson from Protein World, a nutritional supplements company that recently experienced a backlash on social after releasing a campaign that asked their audience whether they are ‘beach body ready’. They define this phrase using an image of a slender, muscular model on their poster. This caused a large number of people to complain that Protein World set unrealistic body ideals. Rather than shying away from critics, the company became involved in an increasingly antagonistic debate about the campaign, responding with rude tweets such as “and it’s ok to be fat and out of shape instead of healthy? We are a nation of sympathisers for fatties” and using the hashtag #getagrip at the end of another tweet. Don’t think of paid promotion as a last resort; it’s an effective complementary strategy for ensuring your brand remains at the forefront of a user’s mind, in a similar way that you might utilise PPC ads in search engine results to promote your website. This helps to make sure that customers are aware of your brand’s presence on the key social media channels to increase the likelihood of them following. Once you have got them to commit to that ‘follow’ or ‘like’, that’s when the really hard work begins. Having grown your audience, you need to ensure you consistently produce content that will make them want to engage with your brand online, and help to further increase your visibility by resharing it with their own followers. Want to find out more? Take a look at our social marketing services, or get in touch today to find out how we could help to amplify your social visibility.